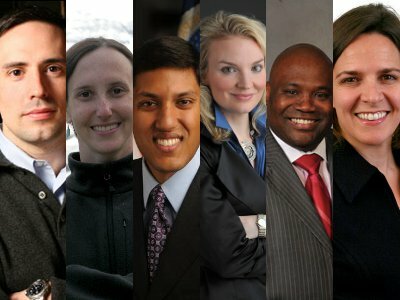 Pictured from left are 2010 “40-under-40” honorees Craig Mullaney, Ilana Solomon, Rajiv Shah, Alyse Nelson, Corey Arnez Griffin and Fiona Macaulay. Photos were provided by the honorees. From the halls of Congress to think-tank row on Mass Ave to the Starbucks in front of the World Bank and the BA line at Dulles, it’s obvious: there’s a new generation of aid & development leaders in town. Washington, DC has long been the world’s capital of the global development community. Now, at a time when the world is reshaping how aid & development are done, it is this new generation of social entrepreneurs, astute advocates, private sector innovators, and donor agency reformers who are at the forefront. Devex, the world’s largest community of aid & development professionals, is honoring these young leaders in the nation’s capital as The Devex Washington, DC 40-under-40. The nomination process has now concluded and the selection committee met on September 8, 2010 to select the list. To learn more about the young leaders selected please visit the ‘Meet the 40 Under 40‘ section of this site.